A global team of researchers have achieved a filtration breakthrough using Metal-Organic Frameworks (MOFs). They have found a way to melt MOFs into a thin coating called ‘porous glass’ while retaining much of MOFs amazing filtering characteristics. According to paper co-author and CSIRO material scientist Dr Cara Doherty, the research could help move MOFs into mainstream industry by sparking a new wave of industrial innovation and technological breakthrough. “While there are more than 20,000 different types of MOFs, only seven are commercially available. We aim to change that,” Doherty said. MOFs are usually found in powder or pellet form, and contain millions of microscopic sponge-like pores. A single teaspoon of MOFs power can have the same surface area as a football field. Possessing such a large surface area allows them to store, separate, protect and sense molecules. 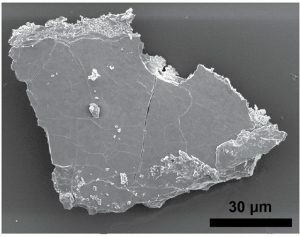 In the course of their study, the researchers discovered that even when melted down into porous glass, MOFs can retain 70% of the pores and 60% of the internal surface area they had as a powder. “By using a thin, nano-porous MOFs coating instead of bulky pellets or powder we can potentially now use MOFs at a previously unimaginable scale,” Doherty said. A MOFs coating could for instance turn previous research into using MOFs to filter drinking water or extract lithium into an industrial reality. Current production methods for porous glass are complex, difficult and result in large pore sizes. This new research could also lead to a simpler way to produce better porous glass; a material found in electrodes, chromatography, medical devices, desiccants, coatings and membranes. A total of eleven universities and research organisations from Australia, UK, Denmark, Slovenia, China, Turkey, and New Zealand were involved in this study.